Taaffeite is a very rare gem variety and is often included in the list of rarest gemstones in the world. At one time only a handful of specimens were known to exist. Recently more material has been discovered, though taaffeite continues to be very rare. Taaffeite has the unusual distinction of being the only mineral that was discovered as a cut gemstone rather than as a faceted crystal. It was discovered by chance by the Austrian gemologist Richard Taaffe (1898-1967) in 1945. Taaffe was sorting through a parcel of gems he had purchased from a Dublin dealer when he discovered that one of the spinels was clearly doubly refractive. 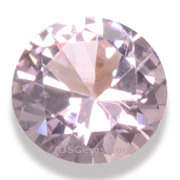 Since spinel, like diamond and garnet, is singly refractive, Taaffe sent the anomalous gem for laboratory testing. It was eventually confirmed as a new species and named in Taaffe's honor. There are many similarities between taaffeite and spinel. They have a similar hardness (8 for spinel, 8 to 8.5 for taaffeite), refractive index ( 1.1712-1.762 for spinel and 1.719-1.730 for taaffeite), and specific gravity (3.54-3.63 for spinel and 3.60-3.62 for taaffeite). But in addition to being doubly refractive, taaffeite also has a different chemical composition and crystal structure than spinel. Where spinel is magnesium aluminum oxide, taaffeite is beryllium magnesium aluminum oxide. Where spinel forms in cubic crystals, taaffeite forms in the hexagonal crystal system. Taaffeite specimens have found been found in a range of colors, including violet, red, green, blue and colorless. The most typical colors are pale mauve and lavender. More saturated reds and purples are extremely rare. Most taaffeite are found in small sizes -- the first specimen discovered by Taaffe was 1.4 cts. The largest known taaffeite was a 33 carat specimen sold at auction in Hong Kong in 1999. Now that taaffeite has been identified as a distinct species, more taaffeite is being discovered. To date, Sri Lanka, Tanzania and Burma have been the only sources for this material, with most samples coming from Sri Lanka. But it is expected that taaffeite specimens may eventually be found in other spinel mining locations, such as Madagascar.